New advancements in tape technology have produced a tape drive that requires less cleaning and provides improved backup/restore operation. This next generation DAT drive utilizes DDS-4 technology to perform up to 16 GB/hr. A new Automatic Head Cleaning mechanism reduces the need for cleaning. This tape drive requires less cleaning and provides improved backup/restore operation. Some of the new advancements include an automatic rotating head-cleaning sweeper that is used during the write or read recovery procedure to dislodge debris in the recording heads and drum. This DDS-4 drive has a MTBF rating of 250 000 hours at a 30% duty cycle. A new Automatic Head Cleaning mechanism reduces the need for cleaning. 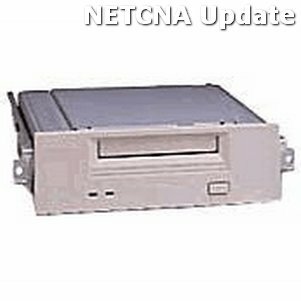 This tape drive requires less cleaning and provides improved backup/restore operation. Some of the new advancements include an automatic rotating head-cleaning sweeper that is used during the write or read recovery procedure to dislodge debris in the recording heads and drum. This DDS-4 drive has a MTBF rating of 250 000 hours at a 30% duty cycle.